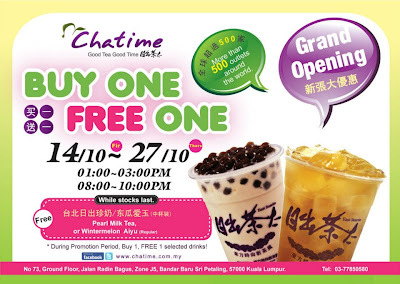 Chatime BUY 1 FREE 1 Promotion is here! for Grand Opening of Chatime at Sri Petaling! Time: 1 - 3 p.m., 8 - 10 p.m.
* During promotion period, Buy 1, FREE 1 selected drinks!